A home office that fits the room. Situated in a loft space slightly above the main living room, this contemporary desk with chrome legs and a glass top makes for a great compliment to this comfy space full of natural light and rough wood grain accents. Take the inspiration from the outdoors and add just a little to your office to tie it all together. In this case, you have the beach just several yards away and the color of white skies and the natural color of sand is the true inspiration for this organic space. 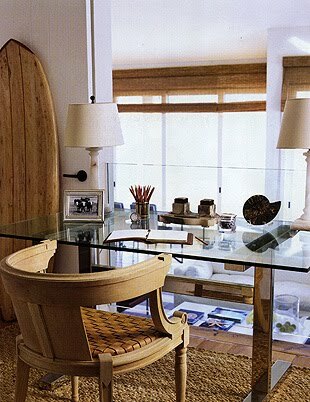 And with just one signature nautilus shell on the desk, it is the perfect accent for a sophisticated room. Just don’t get distracted if you have real work to do.